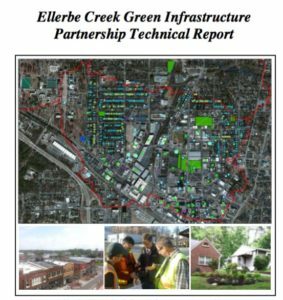 This study of the highly urbanized Ellerbe Creek Watershed in Durham, North Carolina, provides an analysis of how stormwater control measures, best management practices, and implementation of green infrastructure can improve hydrology, increase ecosystem services, and reduce the negative impacts of urbanization in an extremely impervious catchment area within the watershed. Upstream of many other human communities, Ellerbe Creek is one of the main sources of pollutants for drinking water downstream. The report considers the impacts of rain gardens, rainwater harvesting methods, right-of-way bioretention, permeable pavement, greening of rooftops and other surfaces, and more. This report, which was developed with funding from the EPA Urban Waters program, is a great example of how to do perform a stormwater study and analysis of what types of best management practices and forms of green infrastructure are most effective for a particular watershed. More information can be found at the Ellerbe Creek Watershed Association.